Real-time fluorescence detection technology helps biochemist Jose Ordovas to search for genetic mutations in blood samples from human volunteers. 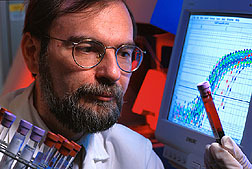 Color differences on the computer screen indicate the presence or absence of such mutations. Suppose we knew all the genes involved in cardiovascular health—which ones contribute to risk, which contribute to protection, and how much each contributes individually and in combination. It may sound like a tall order, but that's exactly what researchers here and abroad are working toward. They want to be able to reduce a person's likelihood of cardiovascular disease based on his or her genetic profile, as well as on the individual's age, gender, and lifestyle habits. A genetic profile would enable individuals to adopt the habits most likely to reduce risk—because different genes or gene combinations respond differently to changes in diet, exercise, smoking, alcohol consumption, or medications such as cholesterol-lowering drugs. And as more and more information becomes available, recommendations for change will become more reliable. One of the pioneers in this field is Jose M. Ordovas, a biochemist at the Jean Mayer USDA Human Nutrition Research Center on Aging at Tufts University in Boston, Massachusetts. He has identified several of the 40 or so genes so far known to affect cardiovascular health. He estimates that there may be hundreds of genes that will ultimately go into a risk-analysis database. Whether the genes for any of these components are manifest depends on an individual's habits as well as age, Ordovas says. Moreover, manifestation is interrelated. For example, in an obese person, a gene for obesity can trigger a normally beneficial gene for blood lipids to express high LDL cholesterol and triglycerides. But if the person stays lean, the beneficial gene could prevail—all other things being equal. Someday, health professionals will have a fairly complete profile of the human genes involved in raising or lowering risk, says Ordovas. Children could be tested early in life so that diet and other lifestyle changes would be started before damage begins. The trouble is, people respond differently to lifestyle changes or to medications, Ordovas says. For instance, reducing total fat and saturated fat in the diet doesn't necessarily improve people's blood lipids equally—if at all. That's due to small differences in their genes. This genetic factor has produced conflicting results in diet intervention studies and led to public confusion over the value of changing one's fat intake. "The appropriateness of one-size-fits-all public health recommendations is being seriously questioned," says Ordovas. 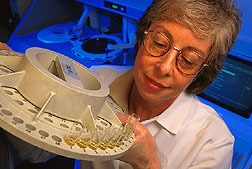 Tufts University medical technologist Judith McNamara prepares blood serum for analysis of lipid concentrations. Since 1983, he and colleagues in the Lipid Metabolism Laboratory have focused on identifying genes that regulate blood lipids. "We're a little beyond just finding genes," he says. "Now, we're starting to see associations between genes and lifestyle." For example, "people with the APOE4 genotype are prime candidates for diet therapy. If they follow the standard cholesterol-lowering diet, they can expect about a 30-percent decrease in LDL cholesterol—which is what one can achieve with cholesterol-lowering drugs. But the APOE4 genotype is a poor responder to the best of these drugs." On the other hand, notes Ordovas, "people with a specific mutation of the APOA4 gene have less than half as much improvement in blood lipids from the cholesterol-lowering diet as those with no mutation." But in a study by other researchers, he adds, people with a different APOA4 mutation consumed a high-cholesterol diet without raising their blood cholesterol. Three years ago, Ordovas enlisted a group of researchers at the University of Cordoba Medical School in his native Spain to study a gene-diet interaction with still another of the seven known mutations of the APOA4 gene. Carriers of this mutation responded to a cholesterol-lowering diet better than noncarriers. Conversely, they had a greater increase in total and LDL cholesterol when they returned to a high-fat diet, says Ordovas. He says a mutation on the APOA1 gene causes a small but similar response among its carriers. So the Spanish researchers, under Ordovas' guidance, looked for a gene-gene interaction between these APOA1 and APOA4 mutations. They found that each gene independently contributed a share to the blood lipid picture: One gene didn't increase or cancel out the effect of another. How do these mutations affect blood lipids? The APOE, APOA1, and APOA4 genes are blueprints for some of the apolipoproteins, or apos, for short. These apos are like the pilots of ferryboats—HDL and LDL—that move fats and cholesterol in and out of cells around the body via the bloodstream. Specific apos pilot specific kinds of ferries into the docks, or receptors, on the cells so that cargo—fats and cholesterol—can be loaded or unloaded. Apos also enable the ferries to exchange cargo in midstream. Ordovas and coworkers have also found mutations on APOB and APOC3. And they are identifying mutations on genes that code for enzymes, transport proteins, and the cell receptors themselves. "We are looking at about 15 genes involved in lipid metabolism," he says. The researchers are now focusing on genes that influence how quickly people clear triglycerides or fats from the blood after eating. One enzyme under genetic scrutiny is lipoprotein lipase, or LPL, which enables this clearance. Since we spend most of our time in a fed state, Ordovas says it is important for researchers to study subjects who are not fasting. One important new finding from work with fed subjects is that triglyceride-rich lipoproteins known as chylomicrons and VLDL "contribute to atherosclerosis as much as LDL," he says. Ordovas believes this research on genetic factors influencing cardiovascular health will become more critical as people in developing countries adopt the higher fat diets and sedentary ways of the West. For many generations, there has been little selection against genes that predispose to coronary artery disease in these populations, so high-risk mutations have built up. These genes didn't express because the people were physically active and ate very low-fat diets. "Now," says Ordovas, "they are adopting a Western lifestyle, and we are seeing a huge increase in heart disease. "—By Judy McBride, Agricultural Research Service Information Staff. This research is part of Human Nutrition Requirements, Food Composition, and Intake, an ARS National Program described on the World Wide Web at http://www.nps.ars.usda.gov/programs/appvs.htm. Jose M. Ordovas is at the USDA Human Nutrition Research Center on Aging at Tufts University, 711 Washington St., Boston, MA 02111; phone (617) 556-3102, fax (617) 556-3103. "Attacking Heart Disease at Its Genetic Base" was published in the July 1999 issue of Agricultural Research magazine.